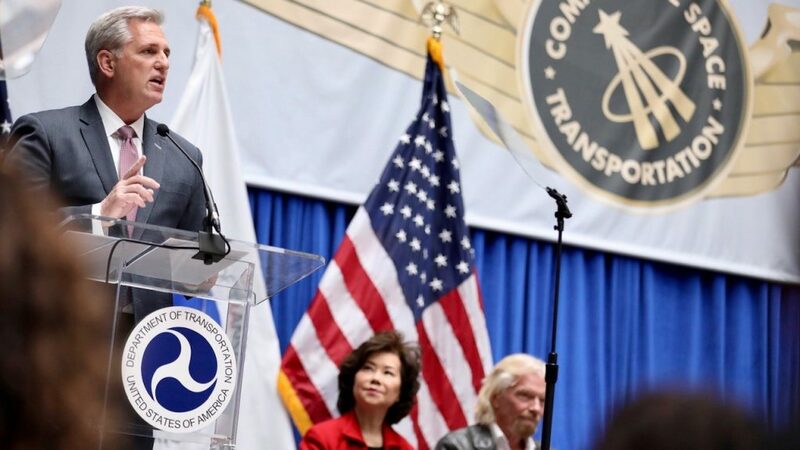 Washington, D.C. – House Republican Leader Kevin McCarthy (CA-23) spoke at a Wings Presentation honoring Virgin Galactic Astronauts. “We gather today to celebrate Mark ‘Forger’ Stucky and Frederick ‘C.J.’ Sturckow, two pilots – two pioneers – whose courage has rekindled our spirit for discovery. “For the first time in nearly a decade, American astronauts traveled to space aboard an American spacecraft. “Fittingly for a mission that signals a return to American exceptionalism, it was launched from the Mojave Desert. “Mojave has a storied history of spurring individuals with the ‘right stuff’ towards groundbreaking achievements. It was here Chuck Yeager broke the sound barrier in his experimental aircraft 72 years ago. “Yeager showed us a fundamental truth about what it takes to accomplish great feats: one needs to have courage, confidence, curiosity, and grit. “Today’s recipients personify those characteristics and deserve the commercial astronaut wings they will receive shortly. “These wings are a rare award, but then again, it takes a rare reservoir of fortitude to pilot a spacecraft. Only two other individuals – both of whom, I should say, also lifted off from Mojave – have received this award and no one has received it since 2004. “Because every space shuttle launch is a technological miracle, let me say a word about the spacecraft that carried these men beyond 50 miles above the Earth’s surface. “It’s called the SpaceShipTwo Unity, and that name tells you a lot about the craft. “Not only did SpaceShipTwo Unity carry its pilots, it also carried experimental NASA technology into orbit. Through this public-private partnership, NASA was able to test its next generation technology, laying the foundation for future advancements that have the potential to bring shared prosperity to the country. “This cycle of innovation is why I have long supported private sector investment in commercial space exploration. Under the U.S. Commercial Space Launch Competitiveness Act, we have laid a solid foundation for encouraging robust investment and bringing dynamic, competitive growth to the industry. “As we celebrate these brave men, we must also pause to remember those who have made the ultimate sacrifice to help fulfill man’s age-old longing to understand his place in the universe. “On October 31, 2014, the SpaceShipTwo Enterprise tragically suffered an in-flight breakup and crashed, killing Michael Alsbury. Pilot Peter Siebold was also seriously injured. “Alsbury rightfully deserve to be honored alongside other heroic explorers who made space exploration possible. “His sacrifice should inspire gratitude and wonderment – a commitment to carry forward their legacy. 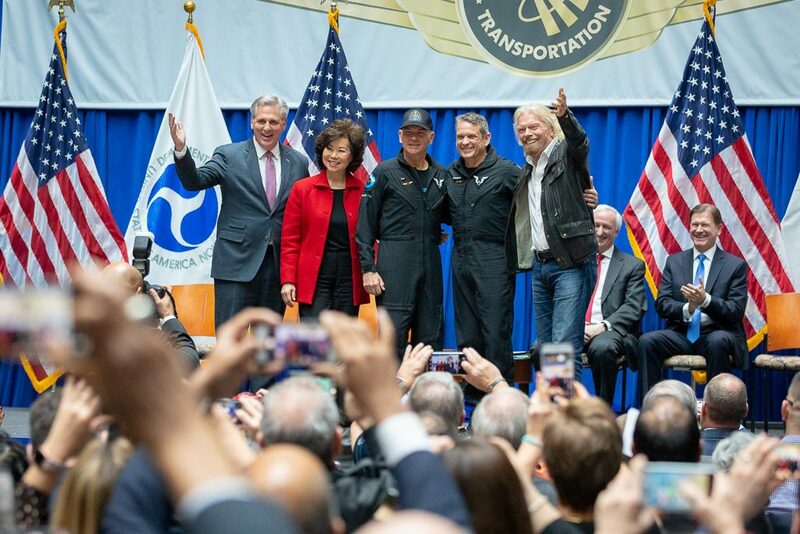 “It is also the story of bold, visionary leadership – and Virgin Galactic has that in spades. “Richard Branson has pushed his company to great heights inspired by his lifelong curiosity in space exploration. “I would like to thank Richard for his commitment to continue the spirit of Mojave by building new spacecraft there. We are very proud of the key role that your team in Mojave will play as your organization makes important new advances. They will add exciting new chapters to the desert’s history of facilitating cutting-edge innovation. “As we look towards future discoveries, we should think about how space exploration can help us rediscover what makes America great. “We often look at the Apollo Moon Landing with pride because it highlighted how Americans can accomplish anything with their determination, industrial might, and common spirit. “Commercial space exploration shows America possesses the curiosity, confidence, and drive necessary to accomplish great things today. It shows we still possess the qualities and conditions necessary for greatness.